Mrs Cody, a 44-year-old mother from Massachusetts, spotted a likeness of Jesus in the residue on the burnt bottom of her old iron. She immediately told her two daughters, who said "Mom, that's Jesus looking at us." The medical secretary said the siting had renewed her religious faith. The image, which she first noticed last week, had reassured her that "life is going to be good", she said. She added that she would keep her old iron - but would buy a new one for everyday use. It's called coincidence. 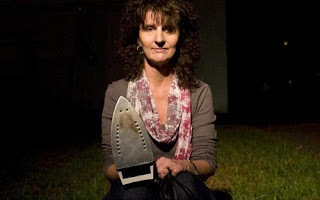 I bet you can find images resembling most people if you look at enough irons! It's certainly not something to take solace from.